Couch gaming and the living room PC are on the rise, but you don’t have to settle for a controller. Couch gaming on living room PCs is entering a golden age, and no longer just for games that use controllers. It’s easier than ever to play everything from shooters to digital card games to RTSes with full mouse and keyboard controls thanks to lapboards—keyboards with a built-in mousepad area, aka a desk away from your desk. We tested lapboards made by PC gaming peripheral makers Roccat, Corsair, and Razer to see how they stacked up against in each other in terms of comfort, control, and ease of use. And after extended use, the Roccat Sova MK still came out on top. 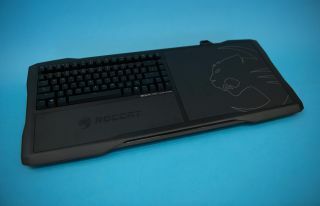 The Roccat Sova, also available in a membrane version, is the classic middle of the road option when it comes to gaming lapboards. It’s smaller and cheaper than the Corsair Lapdog and more capable than the Razer Turret. You can absolutely get better keyboards for less money, but the Sova’s cushions, mousepad, and wrist wrest make it the best possible way to get a desktop experience while sitting on your couch. The Sova has compromised exactly where it needs to in order to make a comfortable lapboard. Although it is big, the size and weight aren’t nearly as cumbersome as the Lapdog. It’s easy to pick up and put down, thanks in part to a cord clip that snaps onto the top of the board and makes sure your mouse doesn’t slide away. The pads for your legs aren’t the most comfortable things in the world, but are more than enough to make using the Sova for long periods of time manageable. The mousepad area on the Sova is a rough matte finish, and while it isn’t as big as a regular-sized gaming mousepad (the Sova mousepad measures roughly 11” by 9.5”) it was definitely large enough for any game I played. Similar to the Lapdog, you’ll probably only feel limited if you play FPSes at an incredibly low DPI and are used to swiping across a huge playmat. Unfortunately, the angle of the Sova made my mouse slide down the pad a little almost every time I took my hand off of it, making that cord clip a necessity rather than an option. Finding a spot that was comfortable and stable both while playing and resting was a bit of a balancing act. The Sova's cramped arrow key layout. The keyboard itself isn’t the best mechanical keyboard I’ve ever used, but it was more than good enough for being mounted in a lapboard. It uses TTC Brown mechanical switches. Roccat also sells a membrane version for less. While the Sova’s layout was fine for games that use WASD, it was a little odd for anything relying on the arrow keys. Instead of being to the right of the QWERTY section of the keyboard like usual, the arrows are tucked under the right Enter key, shortening right Shift, right Ctrl, and removing the right FN key to make room. Additionally, the shorter width means there are no gaps between each set of four Function keys, making them harder to find at a glance. It’s a worse layout than your average keyboard, but it’s done this way to allow the lapboard to be shorter overall—a point I really appreciated when compared to the Lapdog. And the fact that the keyboard is built directly into the board also means that it is positioned for the wrist rest nicely. And oh man does that wrist rest help. I was initially unsure about how comfortable the Sova was on my keyboard hand, but after resting it on the sharp edge of the Lapdog (more on that later), I was begging for the Sova’s wrist rest. The one I used was simply hard plastic, but the rest, mousepad, and cushions are replaceable, and Roccat even says you’ll be able to 3D print your own accessories for the Sova. I didn’t really get to sample this customizability, but it’s an appealing feature for a peripheral everyone will want to use a little differently. The Sova is generally an easy-to-use lapboard, but it is a big piece of plastic that will be sitting around in your living room. Even if it doesn’t have much of an effect on your gameplay experience, finding a spot to store a lapboard like this is important. Razer's Turret is much smaller and designed to be easily stored, but the Sova is thinner than Corsair's Lapdog and doesn’t detach into two pieces. That made it much easier for me to find a place for it in my living room when not in use. The USB cable that plugs into the computer also has a point where it can disconnect (similar to a wired Xbox 360 controller) close to the board itself, which made putting away the cord a lot easier. At the end of all my testing, the Roccat Sova was the lapboard I wanted to keep using. It was the most comfortable across any type of game, and was light and easy enough to move that it wasn’t too bad to use for general computer browsing as well. I didn’t get a chance to try the membrane keyboard version (which shares the same shape and size, so I imagine may be a good cheaper option for those who don’t mind membrane) but the Sova MK is a great way to get a desktop level gaming experience on a living room PC. And while Roccat is planning a wireless version for the future, it'll definitely cost a premium over the wired models. The Razer Turret is in an interesting position on this list, as it’s the only one of the three lapboards that is wireless. It’s also the smallest by a significant margin. For some, the Turret will be the only logical choice thanks to these unique advantages, while others won’t even consider it due to the flat keyboard and smaller mouse area. But one thing that’s undeniable: in distinctly Razer fashion, the Turret is the classiest option out there. Size is not to be underestimated as a factor in these tests. Sure, you want a desktop experience on the couch, but you also don’t want a big hunk of plastic taking up space in your living room. The Lapdog and the Sova are hard to hide, and you’ll almost definitely need to dedicate a spot specifically for storing them when they aren’t in use. The turret not only folds up, it comes with a neat little stand for both the mouse and keyboard that displays them nicely while they charge. Because of this, I never had a problem with battery life for either device, which Razer says is up to 40 hours on the mouse and a whopping four months on the keyboard, and they never got in my way. Being wireless—with the mouse and keyboard sharing a single USB dongle—means I didn’t have a thick cord running from my couch to my TV every time I wanted to play games, and I didn’t notice any wireless lag on either device. I do wish the Turret keyboard had extra USB plugs on it like the Sova or Lapdog, because USB cords for headsets, mics, or wired mice to replace the stock one rarely reached all the way to my TV. Things like wires and storage size don’t directly affect your gaming experience, but they are important factors to those who want their PC to be part of the living room, rather than take it over entirely. That being said, the Turret is not really what you’d think of as a “gaming” keyboard. It’s essentially the same kind of flat chiclet keyboard you’d find on a MacBook laptop, with a bit more spring to each key press. It works well and will be more than enough for those not looking to play fast-paced games on it, but it was a little bit of a problem when I tried to play Overwatch or Warframe. The flatness of the keys and the lapboard overall meant I had to twist my hand slightly to hit a certain combinations of keys, like pressing Q while keeping my fingers on WASD. It wasn’t terrible, but it was noticeably more difficult than using a full-sized keyboard. The mouse that comes with the Turret is another bit that will work fine for some and not at all for others. It’s a nice shape, ambidextrous with two buttons on either side and a good amount of weight to it, but it’s so small that it physically hurt my hand to use. I am personally used to palming larger mice, and the Turret mouse seems to be more suited for gamers partial to using the “claw grip” with nothing but their fingertips touching it. It's a stubby mouse. But its size does pair nicely with the mousepad, and I love that it's very slightly magnetized to it so it won’t slip off. The mousepad area is a smoother finish than the Sova and Lapdog and is significantly smaller, measuring roughly 7.5” wide by 4.5” tall, but it provided more than enough room to use with a higher sensitivity mouse and wrist motions. If you are accustomed to a lower DPI while using the whole pad with sweeping elbow motions, this isn’t the lapboard for you, but I never found myself wanting for more mouse space, even when playing shooters. That is until I finally abandoned the included mouse and plugged in a larger one, which is when I almost ran out of vertical space without even moving it! The left and right motions were fine, but top to bottom risked the edges of the mouse going off the pad. So it’s tough say where the Razer Turret lands. 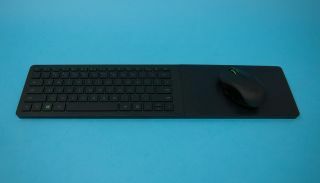 It’s a fantastic small form factor lapboard for using a mouse and keyboard on the couch, but only if you are looking for some very specific things. I wouldn’t reach for the Turret to play FPSes or action games, but not having to fumble with wires coming out of a piece of plastic the size of a skateboard on my lap means I’d prefer it for slower games, or just generally using my PC. The Turret doesn’t provide a high-end gaming experience compared to its competitors, but it provides an ease of use and portability that they don’t come anywhere near. The Corsair Lapdog is the only lapboard on this list that doesn’t actually come with a keyboard. And seeing as it costs the same amount of money for what is essentially an empty tray, it’s hard to recommend for anybody who doesn’t already have the Corsair keyboard to go with it. And even then, the Lapdog can be inconvenient and uncomfortable to use. Only two types of keyboards will fit in the Lapdog: The Corsair K70 or its slightly smaller version, the Corsair K65. 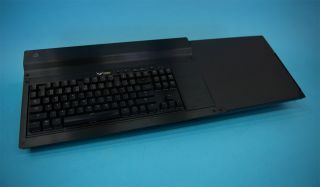 And if you are currently using a K70 or K65 on your desktop computer, it’s not easy to swap in and out of the Lapdog frame. I was hoping the keyboard might quickly snap into place, easily moving from desk to couch, but installing it instead required I unscrew panels held down with six hex screws, put it in place, and then screw the panels back on. It’s not difficult, but it is a process that impedes trying to use a single keyboard for both setups. The curve of the Corsair Lapdog's removal pad, shown upside-down. The inconveniences don’t stop there. The two extra USB ports on the right side of the Lapdog require a power cord be plugged into an outlet to function. The foam cushion on the bottom of the lapboard attaches with magnets so you can decide whether you want to use it or not, but the magnets are just a little too weak, making the two halves slide apart fairly easily when I tried to move or readjust it on my lap. The whole thing is uncompromising in its design—power to the USBs allows them to charge things faster, for example—which would be noble if it weren’t also so uncomfortable to use. Unlike the Sova, the Lapdog doesn’t have any sort of wrist rest. The extra space created by the mousepad being taller than the keyboard was put above the keyboard instead of below it, which looks pretty, but ends up just being wasted space. Instead of being on a pad, my hand in the WASD position was resting on the slightly sharp metal edge of the Lapdog tray. It’s honestly surprising to me that anyone could have tried playing an FPS with their hand in that position and not seen it as a problem. Ironically, I actually had to take off the K65’s removable wrist rest to fit it into the Lapdog. With all of those problems, it has to be said that the K65 and K70 are genuinely better keyboards than what’s built into the Sova. The mousepad areas are nearly identical materials, both a rough matte finish, but the Lapdog's is slightly larger. That bigger area and better keyboard was noticeably nicer to play on when trying Overwatch and other shooters—or it would have been, if the Lapdog frame wasn’t grinding into my hand the whole time. It’s a better high-end gaming product hamstrung by poor design. The Corsair K65 keyboard unmounted from the Lapdog frame. That larger mousepad and room for a numpad keyboard come at another cost, as the Lapdog is the biggest of the three options by a fair amount—both in length and thickness, thanks to that removable cushion. The cushion is comfortable, with a bump in the center of it meant to sit between my legs. But I found myself wanting the lapboard to be a few inches to the right of center, so the bump wasn’t always in the right spot. It also meant I couldn’t set the lapboard down flat on my coffee table when I stood up, as it would sometimes tilt to one side and the mouse would slide off. I ended up finding the whole thing easier to use without the cushion, which then took up more space somewhere else in my living room. Corsair recently dropped the price of the Lapdog down to a more palatable $60 on Amazon, which brings the total package—Lapdog and a Corsair keyboard—to competitive levels with Roccat and Razer. If the Corsair Lapdog had a wrist rest, it would be easy to recommend as a high-end option for people who don’t mind all the little annoyances if it means getting closer to a desktop setup on their couch. But as it stands, those annoyances are hard to ignore when coupled with less-than-ideal usability. I wouldn't recommend the Lapdog to anyone over the Sova or the Turret. Whether you’re more into FPSes or puzzle games may influence which lapboard is best suited to your gaming needs. But what I can say with full confidence is that any of the three options above are better than a keyboard on your lap and a mousepad on the sofa cushion next to you, and they’re almost definitely better than the cheap wireless keyboards with built-in touchpads you may have seen. I’ve used the $27 Microsoft Wireless All-In-One Media Keyboard and the $31 Logitech Wireless Touch Keyboard K400, and while both are fine for general computer use, neither is meant for gaming. For starters, neither has a dedicated area for a mouse, and using a touchpad for most games is a form of self-flagellation no one deserves. The keys on both keyboards are flat and squishy, significantly less responsive than that of the Razer Turret. The only thing they have going for them is that that they are a lot cheaper, but know that you get what you pay for—or in this case, miss out on what you aren’t paying for. As for other high end lapboards, no other PC gaming peripheral manufacturer has entered the race yet. It’s a brand new market for companies like Roccat, Corsair, and Razer, but I imagine others like Logitech or SteelSeries will follow suit if they see success. Also, unfortunately, those of us who use a mouse on the left side of the keyboard are completely out of luck, and we hope to see an ambidextrous option appear at some point. We’ll keep an eye out for any new lapboards that pop-up on the market and be sure to test them out as soon as we can. Unlike testing a regular gaming keyboard, there are a lot of unique factors that go into judging a good lapboard. The quality of the keyboard and mousepad are important, along with the ever-present question of price, but I also looked at the comfort of the board on my legs and wrists—especially after longer periods of time. It’s also important to look at the ease of use, setup, and how much space the lapboard takes up in your living room when it’s not in use. There are factors beyond just gaming that are crucial to consider. As with all high-end gaming components, it must feel good to use. The responsiveness of each key press and quality of the mousepad are just as important as any other factor when comparing your options. It doesn’t matter if a lapboard is perfectly sculpted to fit on your lap if the keyboard feels like garbage to game on. And lapboards have more to get right (or wrong) as they are offering a keyboard and mousepad in one product. Using a mouse and keyboard on a couch can be oddly uncomfortable. It puts your body in a very different position than it’s used at a desk, and a good lapboard has to either compensate for that, or be flexible enough to let you find the position best for you. If you’re going to be playing for a long time, the lapboard needs to be comfortable sitting on your legs and not hold your arms and wrists in a position that will strain you over time. Cushions, wrist rests, and being able to move around easily on your lap go a long way to letting you feel at ease while playing. In addition to being comfortable, a good lapboard has to be usable—both when you are and aren’t playing games. With the exception of the Razer Turret, these lapboards can be big and heavy, and where you put them when they aren’t in use isn’t something most people think about until they suddenly have a 2+ foot long keyboard tray taking over their coffee table. How easy cables are to manage and if you can get up to use the bathroom without throwing your setup into disarray make a real difference in how willing you’ll be to actually use your lapboard. And, of course, cost is king. Luckily, all three options listed above are around the same price point which makes them easier to compare. As I said before, gaming-specific lapboards are a blossoming market, and currently there isn’t really a midrange option. You either go with a very cheap and poor keyboard with a touchpad, or need to hit the $150 mark to get something made with PC gamers in mind. So you might as well make sure your money is worth it and that the lapboard you choose comes with everything you need.